The flood-lit Peace Bridge in Derry (or Londonderry) crossing River Foyle and Guildhall in the background. 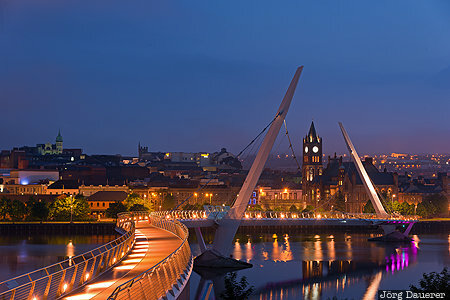 Derry is in Northern Ireland, United Kingdom. This photo was taken in the evening of a cloudy day in June of 2016. This photo is part of the exhibition Bridges (February 2019). This photo was taken with a digital camera.